The world’s search giant, Google has released a new Image Search page for the iPhone, iPod and Android phones. The new Image Search page will allows users to easily search and view images on the phone. The search results will display up to 20 images on a single pages. The new Image Search page is similar to how users access Google images on desktop, the users also can choose a thumbnail from the selection to visit the web page that containing the image or view in full size. In addition, the new Image page is also featured with a search by style filter which was launched on Google Image Search in December last year. 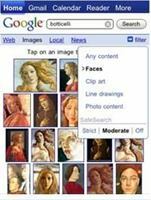 This feature enables users to restrict the search results by clip art, line drawing, faces and etc. The new Google Image Search for iPhone, iPod and Android is now available in Country like US, UK and Japan.